Since the election of 4 September 2012, the Parti Quebecois has tried everything to give political legitimacy, despite its state of « minority government » in the National Assembly of Quebec. When I had finished reading the above statement, Jared Diamond, I immediately made the connection with Quebec society any entière.Il are many similarities between the Greenland Viking society and that of the French Quebec current. Many archaeological remains exposed Vikings in Greenland. First, the Vikings have always refused to share and adopt the lifestyle of the Inuit who lived on this vast territory for several millennia before the arrival of the French drakkars.Les who tried to settle in the territory Quebec, known as Kanada, at the time of Jacques Cartier, were saved in extremis by the diligence of the Indian to make a first winter and they were almost decimated by typhus. This stubbornness in wanting to protect their way of life must be genetic somewhere, because now in 2013, we still want to keep the artificial lung on the welfare state that has served so well neoliberalism in electoral periods previously. While all that is left seems to monopolize the political vision of « fake change » continue to hammer the spirit of Quebec workers the necessity of the struggle for political sovereignty … while a large cleaning is required to the Assembly Nationale.Personne no longer believe anything that touches Quebec politics, except politicians themselves mêmes.Les MPs who managed to get elected or re-elected in the electoral system from another century, are increasingly disconnected from reality and more looking for ways to get re-elected and to maintain a system they know outdated, corrupt, illegitimate, infiltrated by capitalist influences crass and brutally tied to slavery and parasitic values . relive I think the words of Louis-Joseph Papineau, after more than seventy five years. While the greatest economic crisis in history known great strides toward us, while we lose thousands of good jobs and the defense of « Quebec values » becomes more and more fundamental, the government of Pauline Marois just looking to stay place.On seeks to blind people on real issues, on real problems. By blocking the creation of the Economic Development Bank of Canada, the opposition parties seemed to hear an alarm. This is a signal that tends to make it clear to the Parti Quebecois government to look to hang at least a scapegoat to protect the mountain stench rises nez.Combien of billions of dollars have been distributed to the winds during the Liberal government of Jean Charest? Does the PQ trying to forget that you need to punish those who looted the coffers of the state, threatened all the institutions of Quebec collaborating with organized crime and lose confidence in the future! How, following the recent hearings of the Charbonneau Commission, can we tolerate the current mayor, Alexandre Duplessis Laval when we know that a system of collusion has been established and that he himself, the new mayor, participated ? Can you imagine that? because the « boss » is gone, corruption and crime are left with … and because it imposes a responsibility of the government of the city of Laval, there will be more brown envelopes in the sets? In the National Assembly when it comes to finding out what does not work and threaten to try to make this system is supposed to work alone and called « JUSTICE »? We all feel, in Quebec, as the politicos who managed to get elected, will continue to fill their pockets by promoting their boyfriends … so they will not take hold in the sack … themselves! Liberals and caquistes play biceps and play the vulnerability of the minority government. Minority and unpopular. Wait until the next election in Quebec, to the great household is a little believing in Santa Claus, … but also for sure and wait for the « much » worse replaces the worst! Philippe Couillard elect to administer Quebec, under the mandate to the work that needs doing is asking Al Capone to administer the city of Chicago, in 1932 … rather than send him to prison. Hear the Minister of Revenue about economic growth when Europe is on the brink of financial collapse, when the U.S. debt grows at an exponential rate and that all financial experts agree in predicting a Major Economic Crisis (Crisis Crises) is to believe that the minister comes from another planet. Those who currently administer Quebec dangerously play the ostrich, imagining that the lion is blind, deaf and dumb! This business visible from the road to the Epiphany is central to many operations related to corruption … as you understand that I do not need to name it. Worse by giving in this way, we show organized crime, how to get out. The proof of our mismatch the great changes that are coming from around the Earth, we have only to listen to Ms. Marois talk about his willingness to support economic « sacred » growth capitaliste.Pire system, it seems endorse the draft Plan Nord, so dear to Jean Charest and maligned worldwide. As we recently learned that the team of Mayor Gilles Vaillancourt, while he was in office, was voted a budget of $ 500,000 to cope with the Charbonneau Commission as well as any pending lawsuits, me I received a lot of information on my extensive network, from the North Shore Montréal.Ainsi I can learn this morning that a company manufacturing prefabricated walls, roof trusses and beams, located at the edge of Assumption and Epiphany has contributed for years to the election fund of the Quebec Liberal Party (… and Canada too), has lost significant construction contracts following the appearance of mafiosi D’Accurso, to the fall of 2012, before the Commission Charbonneau.Juste before Christmas the company has laid off many workers, but kept at work, all part of the « family » and « friends » of propriétaire.De more in workshop prefabricated walls (which is located in another address that the company « family ») collectors are considered « unsafe. CSSQ by inspection, last spring … but I am aware that If they work, when you read this article.La health workers in this business is threatened in order to maintain « the precious and sacred capitalist profit » in the industrial park of the Assumption, part of the county administered by none other François Legault, himself head of the Coalition Avenir Québec. Mayor Epiphany, M.Verstraete, former Liberal candidate against Scott McKay in 2008, knows something, who faces a serious embezzlement scandal, because I am informed that he has done business with this company L’Assomption. It is therefore not by changing the ruling political party in the National Assembly that we will resolve the problem, but changing an entire corrupt SYSTEM that permeates everything that gives capitalist profits in our society. Quebec is not isolated from the global mainstream of political, social, economic, ecological and philosophical which started recently and that I call « The NEW ERA », but if you make the mistake to ensure that this happens elsewhere, do not touch us, if we try to isolate and play the ostrich, we quickly become a company behind the other, a completely overtaken by the World Revolution society that looks … and we will be overwhelmed by this wave. The more we hesitate to move to clean the corrupt politicians who sit in the National Assembly of Quebec, or where they should be (in prison) and our fate will become inevitable, because no nation, no country has built around ! ‘lax justice tolerated and protected his criminal’s first act of Pauline Marois would be to introduce legislation to dissolve the Quebec Liberal Party for the following reason: conspiracy (offense) put in prison by all the Liberal caucus and making everyone go under investigation, to comb. Having no law enacted to protect the people of Quebec against tyranny and plunder of state assets by poor administration, leaving Jean Charest and the Liberal mafia orchestrate their « system », we inherit a Quebec National Assembly or appointed officials from the « boyfriends » are figure « Fifth Column » in the back of a government more or less legitimate, but absolutely no democratic and respectful of the financial resources of Quebec. 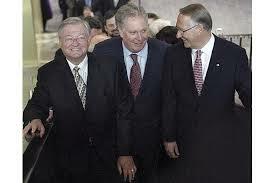 The former mayor of Laval, Gilles Vaillancourt with Jean Charest (center) and former Montreal Mayor Gerald Tremblay: a bunch of politicos linked to organized crime, a system that remains. This is probably not keeping alive artificially structure « colonialists » inherited from the British Empire that we will brag and say that we are better than elsewhere. Should not forget that the best slave is one who ignores his condition and that the most masochistic slave and the slave is more than knowing that his condition, to ignore it by teaching their children to better serve as himself (to say the words that scare). That’s why I’m interested in politics, because I have compassion for everyone who is still on top when it is hit the ground and sought to remove all espoir.Je it seeks to establish a political party to which we will not have to get a nose clip in order to vote for him, but with the confidence that it will be for the people and future generations. I need a political party that will bring together rather than divide or leave people in doubt. If elected I would one day, I promise to bring down the system of corruption starting with abolishing the privileges of senior officials hidden in their bunkers in Quebec, initiating all by their job security in stone and funds pensions indexed to the cost of living … that most Quebec will continue to pay, without ever having the right to have any security for their own retirement themselves. a) a delayed society facing the protection of the privileges hijacked by the 1% that are part all party leaders currently represented in the National Assembly of Quebec. Well, well! Turning round, we know well that in Quebec, it’s been fifty years since it does! So if you’re tired of going in circles, come join the ranks of my new political party, we understand why people are sick and tired of politicos, so we remove the current politicos and their privileges while by asking people their opinion on a Constitution of the State of Quebec! We refuse to let us down, so we want a National Front of Quebec! We invite all those who meet to consider the prospect of taking a Great Walk around the National Assembly in Quebec City, to ask the government to act for the people! The main factors of this collapse (rapid erosion by clearing for pasture, refusal to emulate the techniques of hunting, fishing and heating animal fat Inuit) all fall, in fact, a mental block: Vikings have always continued to regard themselves as « European ».